Onam is Kerala’s biggest festival. It falls in the Hindu month of Chingam (August-September) and marks the return to Earth of the legendary king Mahabali. 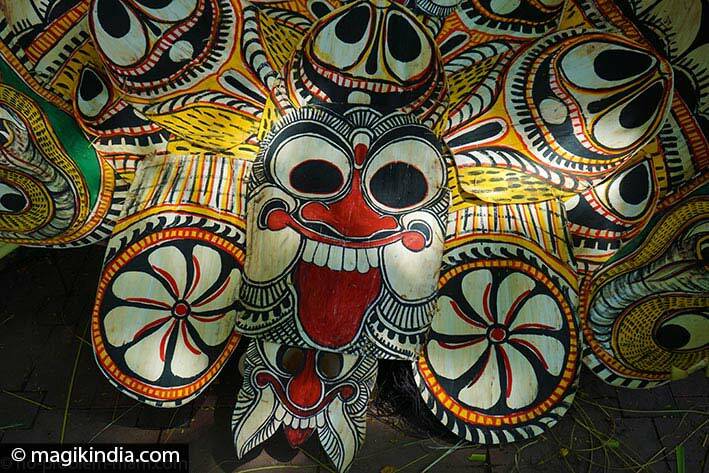 It is the occasion for colourful festivities that spotlight all that’s best in Kerala culture. Although the origin of the festival lies in Hindu mythology, Onam is celebrated with enthousiams by all communities throughout Kerala. Visiting Kerala at this time of year is an absolute must. Once upon a time, an asura (demon) king called Mahabali ruled justly and benevolently over Kerala. His subjects loved him. But he had one fault: he was vain and ambitious. The devas (gods) in the heavens were jealous and feared he would become more powerful than them. So they went to find Vishnu the preserver and asked him to limit the powers of King Mahabali. Vishnu took the shape of an avatar, a dwarf Brahmin called Vamana, and begged an audience with Mahabali. When the king saw the little Brahmin he boasted that he could grant him any wish since nothing was impossible for a great king like himself. 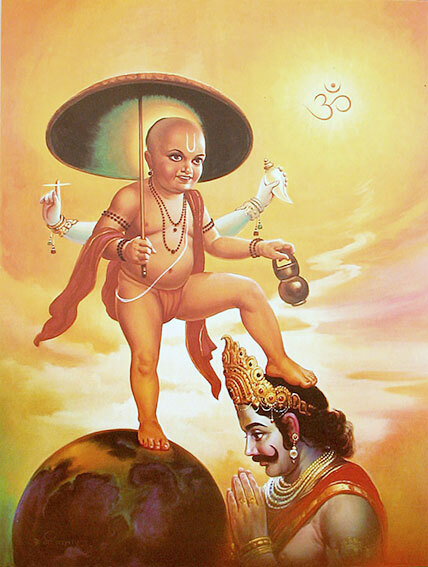 Vamana asked for as much land as he could cover in three paces. Mahabali agreed without hesitation, whereupon the dwarf grew to gigantic proportions. With his first step he covered the sky; with the next he covered hell. Belatedly realising that Vamana was Vishnu in person and that his third step would destroy the earth, Mahabali humbly offered him his head. Lord Vishnu put his foot on Mahabali’s head and pushed him down into Pataal, hell. King Mahabali just had time to ask Vishnu to grant him a last wish: to be allowed to visit Kerala once a year to make sure his subjects were happy and prosperous. Lord Vishnu, knowing him to be a benevolent king, granted his wish. So each year at Onam the great King Mahabali visits his people, and that is why it is celebrated in great pomp throughout Kerala. 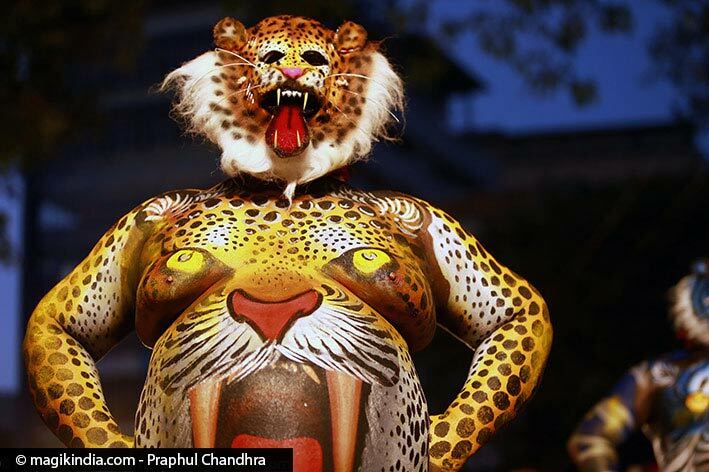 The Onam festival lasts ten days, with festivities that have no parallel anywhere else. Although the origin of the festival lies in Hindu mythology, Onam is celebrated by all faiths and social classes. 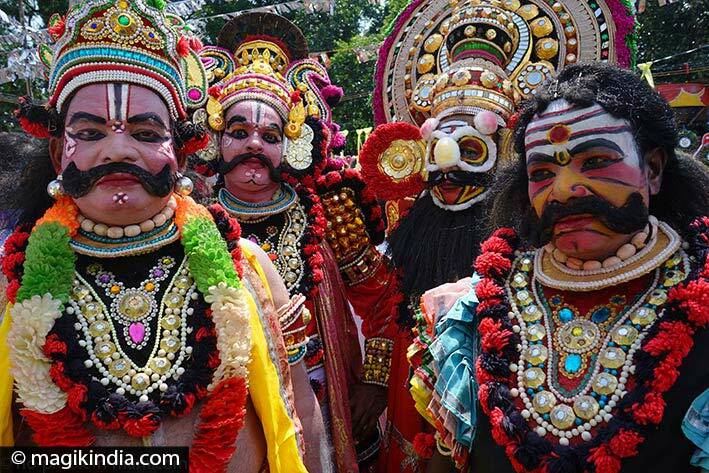 On the first day of Onam, called Atham, there are parades in many towns. Their purpose is to show the richness of Kerala’s culture. 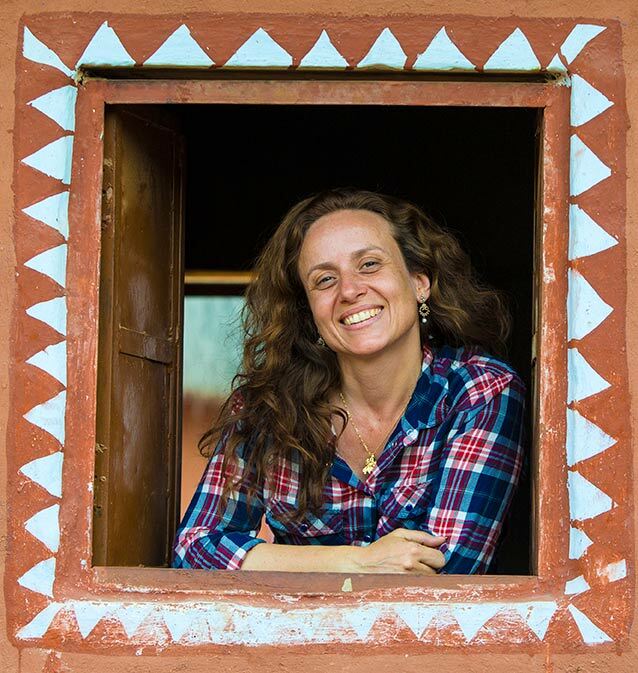 The best example is to be found in Thripunithura near Kochi, where every form of Kerala classical and folk art parades along the streets in a procession called Athachamayam. 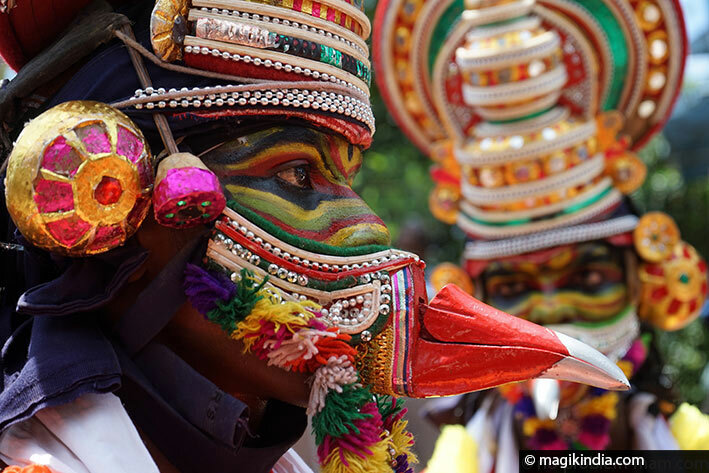 There are Kathakali, Mohiniyattom and Theyyam dancers, Pandimelam and Panchavadyam percussion groups, and tableaux vivants representing mythological scenes from the Mahabaratha and Ramayana. Thripunithura was the capital of the Kochi royal family and in the old days, Athachamayam was celebrated in honour of the king of Kochi. 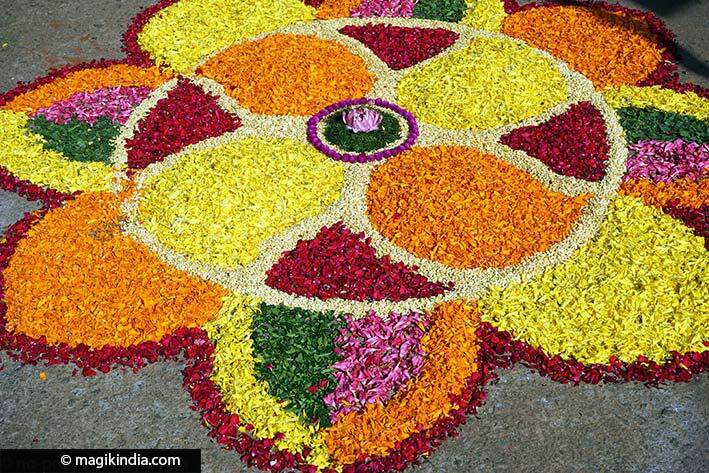 During Onam, people decorate the entrance to their home with elegant geometric flower patterns called ‘pookalam’ to welcome King Mahabali on his return. The art of pookalam takes a lot of creativity and concentration and the resulting artworks are considered auspicious. Traditionally, a pookalam consists of ten concentric circles, each representing a Hindu god, and the lines of the pattern, drawn in cow dung, are considered sacred and purifying. This festive period will also be a hit with foodies. 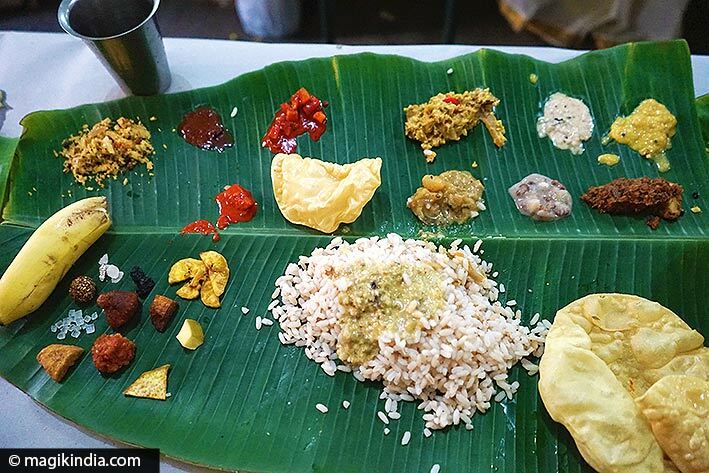 Generous feasts called sadya (meaning ‘banquet’) with rice, all kinds of curries, chutneys and desserts, served on banana leaves, remind us that Kerala boasts one of the most varied and flavoursome cookery traditions in India. Another splendid feature of the Onam festival is the fascinating Vallamkali snake-boat race on the Pampa River in Aranmula. 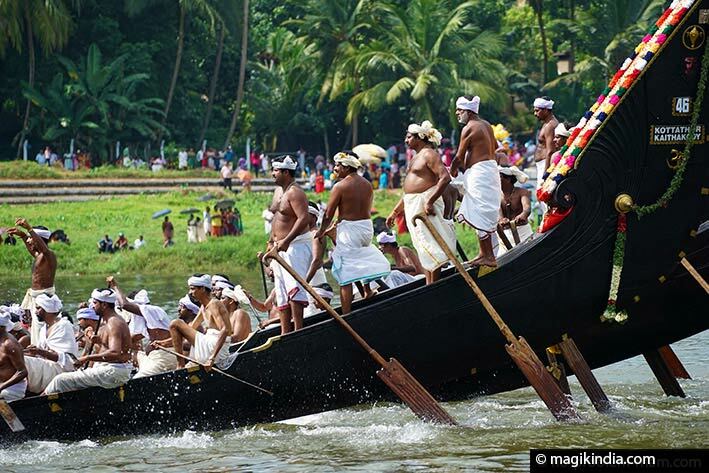 The Aranmula Uthrattathi Vallamkali is one of the year’s biggest festivities in the village of Aranmula and one of the oldest traditional boat races in Kerala. And if all that isn’t enough to sate your appetite and slake your thirst, the joyful Pulikali festival in Thrissur will surely do so.